You still need to watch your budget, and it may be that you will encounter additional service charges or hidden fees related to credit card debt right now. If you are not already up to your eyeballs in hock, avoid a nightmare. Stick with a tight budget for now. Avoid any large purchases or investment schemes that involve alternative healthcare products or medicines right now. You may find that they don't work the way you expected, have been sitting on the shelf too long, or have unexpected side effects. Famous People with Sun in Gemini: Mel Blanc (Sun and Moon in Gemini), Drew Carey, Courteney Cox (Sun and Mercury in Gemini), Johnny Depp, Melissa Etheridge, John Goodman (Sun, Moon, and Venus in Gemini), Steffi Graf (Sun, Moon, and Mercury in Gemini), Elizabeth Hurley (Sun and Mercury in Gemini), Nicole Kidman, Anna Kournikova (Sun and Mars in Gemini), Lenny Kravitz, Kylie Minogue (Sun, Moon, Mercury, and Mars in Gemini), Marilyn Monroe (Sun and Mercury in Gemini), Prince William (Sun and Mercury in Gemini), Brooke Shields (Sun, Moon, and Venus in Gemini), Pete Wentz (Sun and Mercury in Gemini). Sun in Gemini, has the urge for a continually changing self-expression is strong. These natives are often just as interested in collecting information as they are in sharing it. Curious to a fault, Geminis have a finger in everything on a basic level, with the chalenge being depth. Sun Geminis are flexible and changeable people, adapting quickly to new situations generally affords them plenty of friends and social contacts. Usually quite clever and witty, Geminis enjoy intellectual conversations and they are easily bored if they are not getting enough mental stimulation. 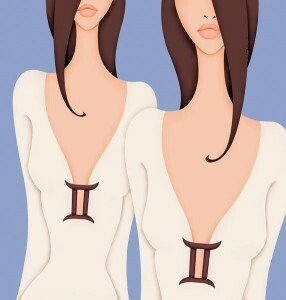 Often quite adept at fitting in with others, Geminis easily adopt the moods of those around them. They are friends to people from all walks of life, and are not easily intimidated. Their ability to detach themselves can make Geminis very objective and observant, but a little difficult to get close to. Although they often have many friends, intimacy doesnt come as easily to Solar Geminis. They are often very impressionable and scattered, with a nervous air that can make more personal characters a little uneasy. It is not always intuitive to trust Geminis to be loyal or to keep secrets. Geminis often flit about, moving quickly and keeping busy every step of the way. Many people with this position of the Sun have gained quite a bit of knowledge in their lifetimes, but they dont often possess specialized knowledge. This is because Geminis have relatively short attention spans. Restlessness is especially common with this position of the Sun. Usually quite affable, Geminis enjoy the light side of life. This tendency to take things lightly makes them quite pleasing to be around; but it can be maddening to people seeking support on the deeper issues in life. Geminis are both interesting and interested. Their wit can be dazzling and their changeability dizzying. At the very least, Geminis will seldom bore you. Famous people with Gemini Ascendants include Drew Barrymore, Harry Belafonte, Bruce Springsteen, Steffi Graf, Charlie Sheen, and Ricky Martin. Those born with Gemini rising see the world as a place to learn. They are constantly curious about the people around them. Sounds earily similar to Sagittarius rising? it can be with, several important differences. Sagittarius seeks to expand their mental and physical horizons in a broad sense, Gemini is mostly interested in moving about in their social circles. They are people who love to ask questions, gossip moving around freely while mingling. Restless and quick in physical expression, natives of the Gemini Ascendant exude an air of impatience even if they dont mean it. In fact, there is a cleverness to Gemini Ascendants that can intimidate some, especially sensitive folk. Their facility with words can be a wonderful asset, although sometimes Gemini rising individuals identify too much with their mental agility and forget, in their personal interactions and communications, to nurture the people around them. A certain lack of warmth in presentation can be the result, and although this style is generally a facade, it is not immediately apparent to most. People with, for example, predominant Water signs may feel a little ill at ease with Gemini rising people while strong Air types more fully appreciate the fun and cleverness of these individuals.I have found two styles of expression common with Gemini rising people. One is bubbly, changeable, talkative, and a little quirky. These natives are interesting and fun. They constantly explain things, whether its their own behavior and opinion or those of the world around them. Another distinct style is a rather cool and intellectual demeanor. These natives are often quite witty and clever, but they present themselves in a less cheerful and changeable way than the first group. Their observations are sharp and the overall manner is a tad brusque. No matter the style, Gemini rising natives are given to analysis and making sense of their world. Their powers of observation are well-developed, they are mentally active and they almost always have something bright or witty to say. It is easy for people with this position to get sidetracked, as their curiosity is large, their minds are quick, and their attention spans rather short! As children, natives born with a Gemini Ascendant are often labeled as the intellectual, inquisitive, and perhaps odd child. Many feel their upbringing lacked some warmth. In one-to-one relationships, Gemini rising people often seek a certain amount of personal freedom and space. They enjoy intellectual debates and exchanging ideas. Although they often demand a fair amount of freedom, they are often just as willing to give their partners room to breathe. Lunar-Moon ruled Geminis are usually pleasant, witty, and charming people, easily changeable when it suits them. With home and family, they can be moody and irritable at times. People with Moon in Gemini are always interesting as they have a fingers in every pie, curious to a fault, and are generally well-informed. Nervousness and worry, anxeity are natural traits with this lunar position. An underlying restlessness is common, and many Lunar Geminis need more stimulation than others. They usually read a lot, talk a lot, and think a lot with this airy, mutable position of the Moon. Much like their homes, they are often a perpetual work-in-progress. Agenerally dislike housework, daily routines, but are big on home improvement. Re-organizing their homes in little-and sometimes big-ways seems to keep them happy, as Lunar Geminis are easily bored by both routine and constancy. Often, this is a reflection of their inner world-the grass is always greener applies here. Inwardly, Lunar Geminis are often unsettled. Moon in Gemini parents are generally more adept at handling the intellectual needs of their children than emotional ones. Others complicated emotions, in general, can be difficult for Lunar Geminis to handle. In their families, Lunar Geminis often take on the role of organizing get-togethers. They are at their best when they have plenty of things to do beyond routine. Moon in Gemini people almost always have a way with words. They are clever and witty, and more often than not can be found chatting with others. They are sociable and friendly, and feel comfortable in crowds. Some pay too much attention to what everyone else is doing, and lose touch with what they really want to do. Generally, Lunar Geminis have a million and one projects going. They are impressionable people as their imagination is boundless. They have an openness to new ideas, although decisiveness and persistence take a blow as a result. Still, versatility and adaptability are some of the stronger traits of this position of the Moon.When irritable, these people can easily become snappy. Their moodiness is complicated-this is not the same kind of moodiness youll find with water sign moons, for example. Usually, difficult behavior stems from inner restlessness. Moon ruked Geminis want to do it all, and have trouble sticking to any one project.When problems arise, the first instinct of Moon in Gemini natives is to talk things out. Their tendency to analyze can give them the appearance of emotional detachment. In fact, Lunar Geminis may be overly comfortable talking about their feelings, but feeling their own feelings doesnt come as easily. Feeling misunderstood is common for Moon in Gemini natives. The only real solution to the problem is learning to get in touch with their own feelings. Life Path: Unity in Duality: Express as many different elemental ideas as possible and find the connections between them. Keep moving, flowing, dont stagnant. Allow your natural sense of freedom, bringing together all the many facets of your life you will experience a sense of openness. You have the potential to become a real channel for the sense of wholeness in the world.